This is FRESH AIR. We'll end the week with our rock critic Ken Tucker's appreciation of Aretha Franklin, who died yesterday at the age of 76. She began singing gospel music in church as a child, was signed to Columbia Records by talent scout John Hammond in 1960 and began having hits in 1967 once she joined Atlantic Records that year. She was commonly referred to as the Queen of Soul, and Ken says there were good reasons for that. ARETHA FRANKLIN: (Singing) Chain, chain, chain. Chain, chain, chain. Chain, chain, chain. Chain, chain, chain. Chain, chain, chain. Chain, chain, chain. Chain of fools. For five long years, I thought you were my man. But I found out I'm just a link in your chain. Oh, you got me where you want me. KEN TUCKER, BYLINE: Aretha Franklin is dead. And we still, 50 years after she made her artistic and commercial breakthrough, can scarcely comprehend the still-shocking power of her singing. FRANKLIN: (Singing) You're a no-good heartbreaker. You're a liar, and you're a cheat. And I don't know why I let you do these things to me. My friends keep telling me that you ain't no good. But, oh, they don't know that I'd leave you if I could. I guess I'm uptight. And I'm stuck like glue 'cause I ain't never, I ain't never, I ain't never, no, no, loved a man the way that I, I love you. TUCKER: Aretha Franklin must have understood early on what fame was like as the daughter of the immensely popular Detroit preacher C.L. Franklin, whose sermons had made him a recording star. Aretha was raised singing gospel, was enraptured by the romanticism of the Great American Songbook and felt the power of rhythm and blues in her bones. She always had ambition. She was a feminist by example. Once she took hold of her career at Atlantic Records in 1967, she allowed no lyric to overrule her interpretation, no producer to shape a performance in a way she did not intend. FRANKLIN: (Singing) Baby, baby, sweet baby, there's something that I just got to say. Baby, baby, sweet baby, you left me hurting in a real cold way. Speak your name, and I'll feel a thrill. You said, I do. And I said, I will. I told you to just be true and give me just a little time. Wait on me, baby. I want you to be all mine. I just get so blue since you've been gone, baby, since you've been gone. TUCKER: Franklin became a pop star at a time when soul, rock, pop and R&B mingled promiscuously on the radio. This enabled her to reach young, white, rock fans, as well as the age-spanning black audience that always marveled at the technical prowess of her voice and her phrasing. This kind of popularity meant that no one batted an ear when she covered the Beatles' "Eleanor Rigby" or indulged her fondness for Schmaltz by cutting the Frank Sinatra anthem "That's Life." Aretha's sound predated all of the vocal histrionics that characterized the recent era of TV shows like "American Idol" and "The Voice." She could over-sing and over-emote more extravagantly than any of those would-be pop divas. And unlike them, she could also rein in the histrionics to give immensely subtle shadings to lines, to individual words. FRANKLIN: (Singing) Always sitting around, me and my man. I don't want nobody always sitting right there looking at me and that man, be it my mother, my brother, my sister. Would you believe? I'll get up, put on some clothes, go out and help you find somebody for theirself (ph) if I can. Yes, I will. Now, I don't mind company because company's all right with me every once in a while. Yes, it is. I tell you, I don't mind company because company's all right with me every once in a while, yeah. But oh, when me and that man get to loving, I tell you girls, I dig you but I just don't have time to sit and chit and sit and chit-chat and smile. Don't send me no doctor, filling me up with all of those pills. I got me a man named Dr. Feelgood. And, oh, yeah, that man takes care off all of my pains and my ills. His name is Dr. Feelgood in the morning. TUCKER: For all her regal bearing, the key to the emotion in Franklin's singing is very often her unsure sense of self. 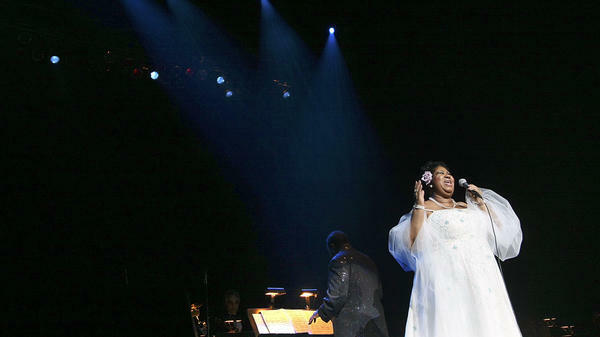 Her music regularly disclosed a vulnerability and insecurity residing within the head that wore the Queen of Soul crown. She sang with a mighty assurance about being shaken and shattered by love gone wrong. Franklin's genius strategy was to seem as though she might be on the verge of losing control of her performance while maintaining impeccable command. This is true whether we're listening to an early hit like "Respect," or her staggering 2015 Kennedy Center Honors rendition of "Natural Woman" in front of a visibly moved President Obama. TUCKER: Franklin never, at any point in her career, lost the ability to give incandescent concert performances. But that's not to say you could rely on her. Her shows could be unpredictably listless or disorganized or sullen. Genius makes its own demands on its admirers. Franklin was like her work - passionate, yes, but also complicated and ultimately unknowable. No one's voice has ever soared like this. No one has ever seized at lyrics and made them do her bidding the way she did. No one has ever given us pleasure with such full-throated abandon as Aretha Franklin did and does. CONSTANCE WU: (As Rachel Chu) So your family is, like, rich? HENRY GOLDING: (As Nick Young) We're comfortable. WU: (As Rachel Chu) That is exactly what a super-rich person would say. BIANCULLI: ...Terry talks with Kevin Kwan, whose best-selling novel, "Crazy Rich Asians," has been adapted into a new film. The story is inspired by his childhood in Singapore surrounded by crazy rich families. Hope you can join us. BIANCULLI: FRESH AIR's executive producer is Danny Miller. Our technical director and engineer is Audrey Bentham, with additional engineering support from Joyce Lieberman and Julian Herzfeld. Our associate producer for digital media is Molly Seavy-Nesper. Roberta Shorrock directs the show. For Terry Gross, I'm David Bianculli. Transcript provided by NPR, Copyright NPR.